Personally, simple food, cooked well, it always has the IT factor. This recipe is something like that. There might be different variations in different parts of the world (Eggs in Purgatory for example), Shakshuka is a well loved dish in this part of the world. Usually, a breakfast favorite, I prefer it ‘anytime I’m hungry and aching for quick food’ delight. I hope you enjoy my take, I guess the only difference in my recipe is the vine tomatoes, adding a plump texture in the bite as well as the additions of black salt and all-spice. 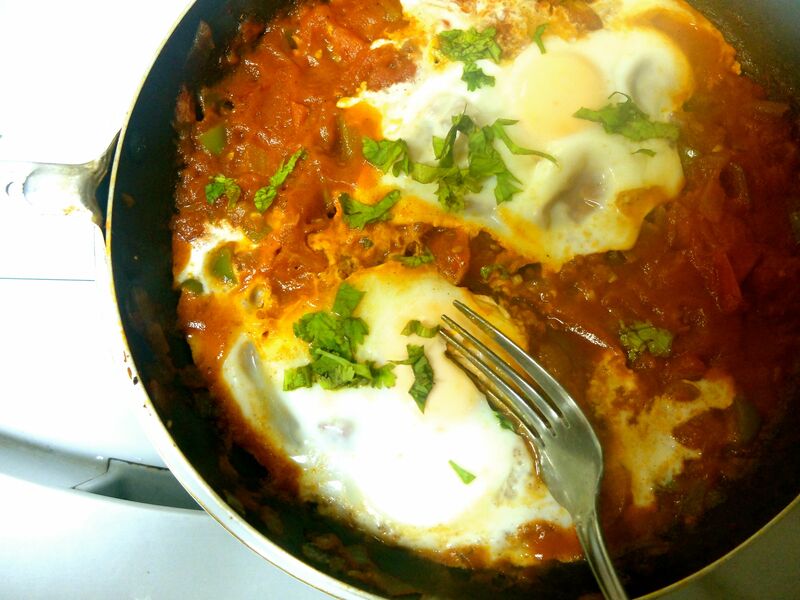 I love when Shakshuka has a spicy kick and if you’re anything like me, this one’s for you. Heat a medium sized pan and add the onion. Sweat the onion off for 1-2 minutes until it turns soft and translucent. Add garlic, capsicum and vine tomatoes and sauté for 2 minutes until you can smell the fragrance of ingredients combined. Add the spices, chilies and sugar. Add chopped tomatoes to the mix and let cook for 1 minute or so. Make small spaces in between and add 3-4 eggs. Cover it with a lid for 4-5 minutes until the eggs are cooked. Here I’ve cooked them all the way through. But, you can cook them to your liking. Ramadan Kareem, everyone. Stay blessed and blissed. – Self-proclaimed addict of all the fine(r) things in life. Very Tempting Recipe for suhoor…will try it Inshallah…thanks for sharing..